Was Jesus declaring poverty as a blessing and not a curse as taught elsewhere in scripture? According to the blessing of Abraham, which has now come to us through Christ, God formerly declared poverty a curse. So was Jesus conflicting with God? Deuteronomy 28:45,47-48 says, “All these curses will come on you. They will pursue you and overtake you until you are destroyed, because you did not obey the Lord your God and observe the commands and decrees he gave you. Because you did not serve the Lord your God joyfully and gladly in the time of prosperity, therefore in hunger and thirst, in nakedness and poverty, you will serve the enemies the Lord sends against you.” This is clearly the opposite of blessing. If Jesus was just referring to being financially poor alone, then one could simply leave their job, their home, and all their possessions, go live on the street and be saved. Missionaries wouldn’t even have to bother going to preach the Gospel in poor countries, because… well they’re poor, they must already have the kingdom. But this cannot be true, because it’s not what the rest of the Bible teaches us in regards to salvation. We must interpret scripture with the whole of scripture. And the Bible clearly teaches that we are not saved by works, or by anything that we “do” or “do not” have. No… we are saved by grace through faith in accepting Christ as our Savior. It’s not about your financial state, it’s about your heart state. It’s about knowing one’s own destitute poverty in that you cannot save yourself. It’s that coming to realize that you are hopeless without God. Those who equate poverty with spirituality love to use the story of the Rich Young ruler as a proof text that Jesus wants us to be poor and have little to nothing. But this is not the point of Jesus’ interaction with the young man at all. It was two fold: First Jesus wanted him to understand that no matter how much of the Law he kept, he still missed it in one area. In other words Jesus was pointing out the young man’s own inability to keep the whole Law. Remember Jesus taught that if you fail to keep even one part of the Law, you fail to keep it at all. Jesus was about to fulfil the whole Law in His sacrifice on the cross, and was essentially pointing the young man to Himself. Secondly Jesus was exposing the heart of the young man. Him having riches wasn’t the problem, but that he had allowed the riches to have him. He loved money. If he didn’t, then he wouldn’t have struggled with the thought of giving it away. I believe that if he had of sold all his possessions and given the money away, God would have eventually given it back to Him. Poverty-theology people cringe when you say something like this but wasn’t it Jesus who promised, “Give and it will be given back to you with the measure that you give it.” Jesus made all kinds of promises concerning rewards of a return for giving. Here’s the key: If you can have money without it having you, then you can give of what you have for kingdom purposes whenever God requires you to. There’s no hesitation in your giving, because there is no heart attachment to it. When we keep our hearts right, God can easily flow wealth to us and through us to others. Now back to the initial point…. Here’s the thing, whether you have a lot of money or very little, a person can recognize their need and turn to Christ. Ones spirituality is not determined by their abundance or lack of possessions. A monetarily poor person without Christ is just as lost condemned as the monetarily rich person without Christ. Jesus makes a point that yes, it is easier for the poor to recognize themselves having need. However He is also speaking of poverty in the sense of a humble recognition of one’s position of hopelessness without Him and a dire need of salvation. And that those who recognize this are blessed, because of their humility they are ready to receive the Kingdom, as opposed to someone who thinks they do not need God’s salvation. Is it harder for the rich to see themselves in need? Absolutely, this is why Jesus declares, “Woe… (or warning) to the rich…. BUT it’s not impossible. All things are possible with God, as Jesus Himself answered His disciples regarding the rich entering the Kingdom. A number of years ago I met a homeless man on the street, gave him a coffee and sandwich and started to share Christ with him. He refused to listen to me, and in fact got quite angry. Even though he was in great physical need, he was blinded to his even greater spiritual one. At the same time I also know personally of a very wealthy man who came to Christ in a time when he clearly saw his need. Now he uses his wealth to bless the poor and help various ministries all over the world. I find the argument that teaching about prosperity is an offence to people starving in Africa to be quite silly and lacks common sense. And to counter the argument I’ve asked people, “Do you think if we were to ask one of those starving individuals if they felt blessed by their condition, that they would answer with a resounding “Yes”? I haven’t had one person answer yes to this question yet. And of course not, it would be absurd. And so is the argument to begin with. Lack of prosperity is why they cannot afford food, clothing, and an education. Listen… if God is so against people being rich, specifically His people, then we should not have instructions from Paul like, “Instruct those who are rich in this present world not to be conceited or to fix their hope on the uncertainty of riches, but on God, who richly supplies us with all things to enjoy. Instruct them to do good, to be rich in good works, to be generous and ready to share..” (1 Timothy 6:17) Share what? Of their riches! Paul doesn’t tell them to not be rich, but to not let there hope rest in it, and be generous. There are many passages and promises regarding God’s people prospering, not to selfishly consume it all on themselves, but to give into the work of the ministry. As long as we live within a monetary based system, we will all need to use it just as we all already have been doing so thus far. And whatever we do, we are to do unto the Lord. So steward it His way. Don’t let money rule you, you rule it. Jesus commended us to be wise in the use of money more than once. Just read the Parable of the Shrewd Manager in Luke chapter 16. Listen, if the people who teach that God wants us to be poor really believed what they taught, they should have nothing at all… ever… period. But we don’t see that happening. The truth is that holiness is not determined by our earthly position and possessions or material things. It is determined by our reception of Christ and by HIM making us holy. Asceticism (a monastic practice that believes having less is more holy) is a dangerous doctrine, it causes God’s people to submit to unnecessary poverty and lack, and it holds back ministries from growing and caring for more people due to their hands being tied by lack of finances. I grew up in and with a poverty mentality, and I realized as I have studied the Bible more and more in this area, that this is not what Jesus is teaching. Otherwise he would be at odds with what God is saying. Throughout the rest of the New Testament God very clearly and intentionally shows us how the blessing of Abraham (which includes monetary blessing) was brought to us through Christ. So all who put their faith in Christ share the same blessing Abraham received because of his faith. “Christ redeemed us from the curse of the Law, having become a curse for us– for it is written, “CURSED IS EVERYONE WHO HANGS ON A TREE “– in order that in Christ Jesus the blessing of Abraham might come to the Gentiles, so that we would receive the promise of the Spirit through faith. It says….. So then, those who are of faith are blessed along with (or in the same manner as) Abraham, the man of faith. BUT… we can only experience it BY FAITH. If we don’t believe it, we won’t experience it. We must not forget that Jesus came to lift the curse. He became poor so the poor might become rich. Poverty IS NOT A BLESSING, it is a part of the curse. No where in scripture does God call material poverty a blessing. Sure He may call some to live with less, as a personal choice and conviction, but not with nothing at all. 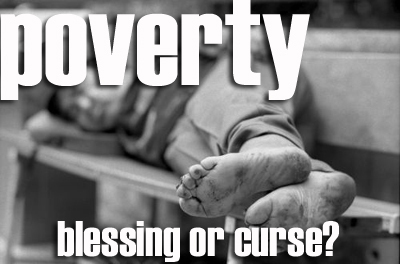 All throughout the Bible poverty was a referred to as a curse, and today it remains… A CURSE. For you know the grace of our Lord Jesus Christ, that though he was rich, yet for your sake he became poor,so that through his poverty you could become rich.